Narendra Modi has always been in news for some or the other reason. From turning into a drummer to playing flute, Prime Minister Narendra Modi has proved that he is a multi-talented person. And now he has donned the cap of a photographer during his visit to Chhattisgarh. The Prime Minister was in Chhattisgarh to celebrate the 16th Foundation day event in Naya Raipur, which is going to be the new capital of the state. The prime minister inaugurated the Jungle Safari Park in Chhattisgarh. At the park, he pulled out a camera and stepped close to a tiger’s cage to capture pictures of the big cat. The photo trended in social media. “One for the camera… at the Nandan Van Jungle Safari,” Modi tweeted. Have a look at how Twitterati reacted to this picture; some mocked him, while some lauded the PM for his efforts. Real Arvind Kejriwal Should See This !! One Tiger Is Clicking Pic of Another Tiger. What a Co-incidence. 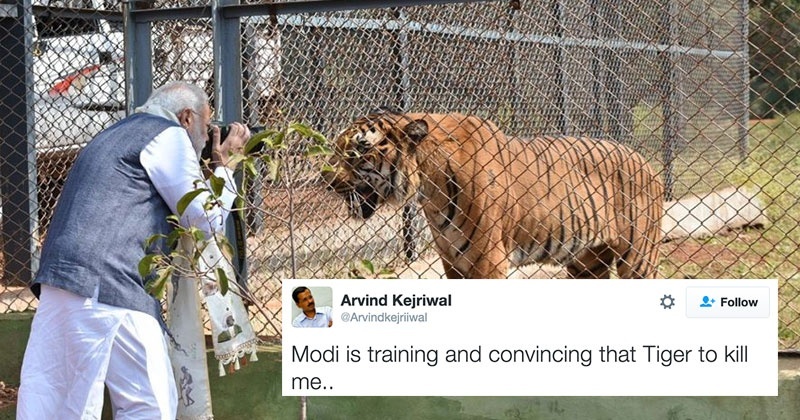 Modi is clicking pic of Tiger Outside the CAGE, but see Nehru & Indira were playing with Tigers. So how did you find the picture ? Do share your views in our comments section below.